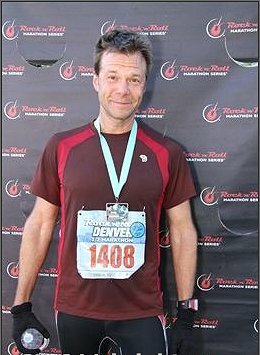 Today was the Denver Rock and Roll Marathon and 1/2 Marathon. For the past 3 years, I've opted for the 'full marathon'. And every year I've watched the 1/2 marathoners at the split point heading back to the finish and thought, "Ooooo.... that would be a happier time"
Of course I'm kind of kidding. I've never regretted doing the full marathon, but given this year I'm doing the California International in early December, the timing to finally run Denver as a '1/2' worked out pretty well. It's funny that we call 13.1 miles a '1/2 marathon'. Having raced both (and a bunch of other distances (is a 10K a 1/4 marathon??) it actually has little to do with the feel of racing a marathon (and vice versa). Both are completely different types of races, and each a great distance in their own right. Plus, I think it's unfair to the folks running 13.1 to call it a 'half' of anything. It's a substantive distance and race in it's own right. It would be like calling a 'marathon' a 'mini-ultra' - that's just cold. In fact, I've learned that each distance has it's own feel. Even a 5K (about 3mi) and a '4 miler' have a different feel when you run them. 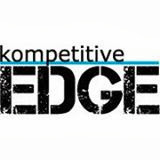 You approach each distance differently and when I plan a race, I generally have a different strategy for how I plan to race each. But here we are, stuck with the '1/2 marathon' label. 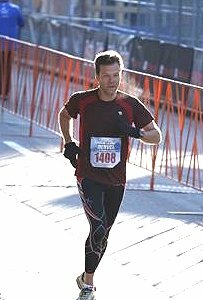 And I'm not really going to expend a whole lot of energy making a point to call it a 13.1, or worse; make up my own name. Plus, some people might like that's it has the word 'marathon' in it - so I'll leave it at that. So today was the Denver "1/2 Marathon" for me (and Paige). My goal was to run it in under an hour and 30 mins (or sub-90). I ran Georgetown as a sub-90, but Georgetown is 'downhill' (although as I mentioned in my Georgetown race report - that's an oversimplification of the course). Still - I wanted to have a 'legit' sub-90 under my belt and Denver is a legit course in anybody's book. It's not super hilly, but it is at altitude. The course is really great. A little bunched up through the first mile. Even though they have corrals, it's the honor system - meaning you tell them what you 'think' you'll finish the race in when you register and they assign you a corral. I estimated 1:29 flat. Most people are good about it, others are a little overly optimistic or just downright concocting their own reality. After a fast little descent to 'Lo-Do', you make the gradual climb up to the the top of the '17th street hill' at about mile 4. It's a hill that looks more intimidating than it is. Plus, there is a nice one mile flat to downhill stretch to City Park that really is quite nice to run and let's you recover, so I always kick up that hill. From there it's just some slight uphills and downhills, with the last mile and change being pretty good downhill to the finish. I actually felt kind of 'off' today. Unlike Georgetown, my stomach was fine, but my legs just weren't as snappy as the Park to Park 10 miler. At around mile 2 or 3 I was considering that if I really fell off my goal pace that I'd turn it into an easy fun run - but I kind of knew in the back of my head that I wouldn't cash out like that. I've never bailed on a race in my life. I've stopped to hurl, been knocked unconscious (mountain bike racing) - but never DNF'd (Did Not Finish) and never just backed off to easy pace. I don't know if that's noble or stubborn. Probably the latter. Then at about mile 7 or 8, things came together and I just started running faster. I don't know what it was, I just felt more like myself gradually over about 2-3 miles leading up to that. Go figure. Maybe not enough tapering? Not enough warm-up? Too many turns in the early part of the course? Who knows? Coming into the last mile I had dropped a few folks on the last hill. Then I joined up with a little group that was hauling down the home stretch. My average pace was around 6:50, but in that last mile we were running 6's to 6:10's the whole way. My limiter was actually how fast I could turn my legs over to keep up with my pace. I was max'd out. I kept trying to surge into the next group just ahead of 2-3 runners, but that wasn't going to happen (plus I'm sure they were surging at the same time). I kept thinking, "Man, if I take one mis-step here, I'm going out the front door and it's not going to be pretty". Around the last turn I saw the finish line clock and knew I'd break 1:30. That really jazzed me up because early on in the race I'd have bet against me and given 3:1 odds. That's the "1/2" though. A lot can happen in 13.1 miles. I crossed the finish line strong. No wheezing or bending over. Just waltzed through the finish area nice and tall. I love downhill finishes - no puking. Then I wandered back to watch Paige come in. This was her first 1/2 and she was trying to come in under 2 hours - which she did. She looked really strong too coming in. I guess her IT band was really bothering her and she felt she could have gone faster, but decided to keep things on plan. We collected her checked bag and got her warmed up. It was cold out at the finish, but of course you felt great still radiating all that body heat. Then after about 10 mins you got the serious chills. I swear I would have been happiest with my First Ascent EB winter parka on if I had it. We had an awesome rest of the day. Recovery of a warm lunch (and beer), a big 'family nap' (me, Paige and Luke all cuddled up on the same bed). Then out to dinner at Hacienda for fish tacos, margaritas and a banana empanada with ice cream desert. Yeah, we figured both of us are in calorie surplus today - even with the run. But it was a nice celebration to splurge like that! So now Paige is happy because her busy season is done and she has 3 weeks of unstructured training. I've got about 7 weeks until the California Marathon. I'm looking forward to it and need to start thinking about 'that' distance again. Like I mentioned - the marathon is unique and requires some different thought process, strategy and approach to race it well. But it's going to be a fun trip, and I've had a great season up until now so it's hard to complain regardless of how that race comes out. 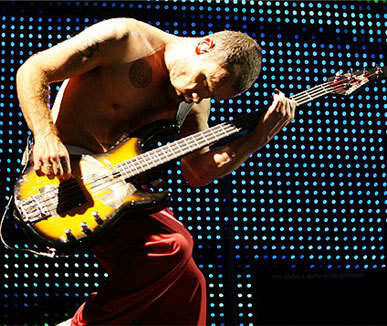 Oh - so why is there a picture of my favorite bass player (Flea) from the RHCP on this post? Well, Denver is part of the 'Rock and Roll' marathon series, and the RHCP are my favorite R&R band. 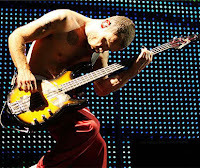 Plus, Flea was recently featured in Runner's World, "I'm a Runner" series.